ORLANDO, Fla. (AP) — There was a closer on the floor when the Lakers faced the Magic, and it wasn’t LeBron James. 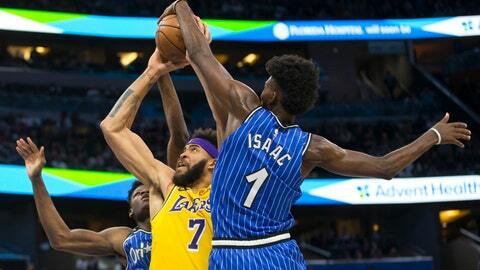 Nikola Vucevic had 36 points, including eight straight in a crucial stretch of the fourth quarter, and Orlando beat Los Angeles 130-117 on Saturday night, ending the Lakers’ four-game winning streak. James was on the bench the entire fourth quarter as the Lakers went to a small lineup to trim a 21-point deficit to just 10 with more than four minutes to play. Vucevic snuffed out the rally right there, getting a three-point play against Michael Beasley and following that with five more points to push the advantage back to 13 with just over two minutes to go. Vucevic hit 15 of 23 shots, including 10 of 14 in the second half. He got help from D.J. Augustin, who had 22 points and seven assists, and Evan Fournier, who scored 15. Terrence Ross had 13 points and Aaron Gordon and Jonathon Simmons scored 12 each for the Magic. The Lakers got 22 points from James, 19 from Lance Stephenson and 17 from Brandon Ingram, but were down 15 early in the second half and never got closer than 10 in the fourth quarter. James averaged 29.8 points on 55.1 percent shooting during the win streak, but wasn’t much of a factor against the Magic. Orlando opened the second half with back-to-back 3-pointers from Augustin and Fournier and a dunk from Vucevic that pushed the lead to 70-55. The Lakers finally extended their defense, opening easy lanes to the basket, and Augustin and Fournier took advantage. The two went unimpeded to the rim, feeding Vucevic, who had 16 points in the quarter, or getting easy layups for themselves. Ten of the next 11 Magic baskets were layups, and Orlando led 100-81 by the end of the third. Lakers: Lonzo Ball is shooting 51.3 percent (19 of 37) from 3-point range, but just 17.8 percent (five of 28) in road games. … Three Lakers reserves reached double figures, led by Stephenson’s 19 points. Josh Hart had 13 and Kentavious Caldwell-Pope scored 10. Magic: Jonathon Isaac had four blocks in the first half, including two against James. He finished with five blocks and seven points. … The Magic and Lakers have split the season series seven years in a row. This was their first meeting this season. Lakers: At Miami on Sunday night. Magic: Host the New York Knicks on Sunday night.